You know your customers, right? Well, you may be surprised to learn that your current customers may actually be different than your ideal customers. Why is that? Because of buyer personas. So, what are buyer personas and why are they an important aspect of your small business? This blog was created as a resource to help you understand the role they play and the impact they can have. For those of you that don’t know what a buyer persona is, let me explain. A buyer persona is a semi-fictional character based on your ideal customer. This persona is created by using market research and data about your current customers. But what is this research and data based on? Great question! When creating buyer personas, you will want to consider demographics, behaviors and goals of your customers. Bonus Tip: the more details you include, the better! The major benefit of having buyer personas is that it helps you, the business owner, learn what the ideal customer you want to attract to your business is. It can also add a personalized touch as you can relate more closely to your customers because you understand them better! And when you understand them better, you can tailor your content, products and services to fit their needs. Ready to create your own buyer persona? Let’s get started! The first step when creating a buyer persona is doing research, conducting surveys and interviewing your target audience. You can use current customers, potential customers or a random assortment of people that are not current contacts. Sort through your current contacts and look for trends. Create forms on your website that gather persona information. Interview both customers and prospects. Remember, you don’t have to do every single suggestion, but the more detailed you are, the better! You’ve gathered your data, conducted your interviews and done your research. Now what? Well, it’s time to dive into that information and look for patterns within the answers. After you’ve sifted through this information, you should try to develop one main persona. If this is your first time creating a buyer persona, check out this tool that helps you build personas! An important part of your interview process is that you should collect some basic demographic information. If you conduct your interviews in person or over the phone but people aren't willing to give out specific information, send out a follow-up email. To help you understand how much detail needs to go into your buyer personas, I want to give you an example. 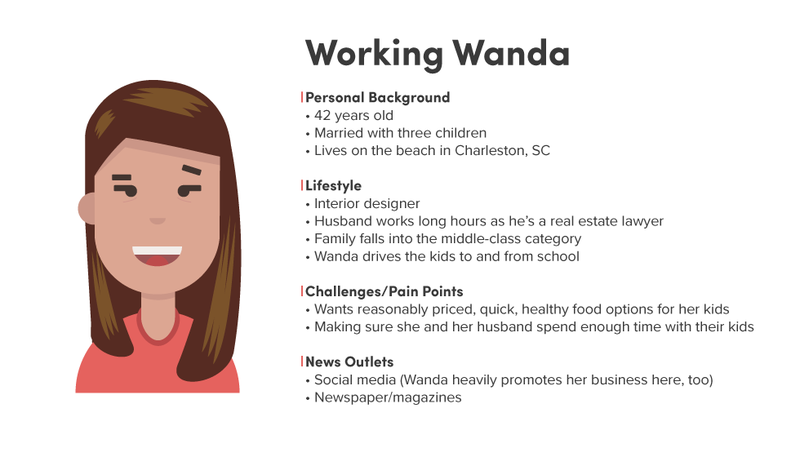 With this buyer persona, you can picture Wanda’s life, right? Even though this information may have taken a while to retrieve from your research, you now have a buyer persona and can better understand your customers! You may think you know your ideal customer, but it’s possible that you’re missing an entire audience! Buyer personas do take some time to create. In the end, though, creating them allows you to provide more value to your customers because you’re delivering what they actually want. When you understand your customers, they will notice, and they will return to your small business!